Meet sweet, 5 year-old Daniella, who suffers from epilepsy, hypotonia, cortical blindness and global developmental delay. She frequently is overwhelmed by frightening seizures which have caused her to be hospitalized. She also cannot sit upright or maneuver a wheelchair. These unthinkable challenges would seem impossible to overcome; however, Daniella retains a spark of joy that never dims. Daniella, as other children, loves Dora the Explorer and Elmo. Her favorite TV show, though, is Mickey Mouse Clubhouse. The Magic of Disney always gets her eyes to twinkle like a wishing star. Daniella and her family occasionally take relaxing strolls outdoors. She particularly enjoys hearing the varieties of bird songs. Daniella finds delight in other ways, but her truest happiness comes from a strong heart. According to her mom, Daniella is always content and she never cries. Daniella is an example of courage for everyone who gets upset over life’s little paper cuts. 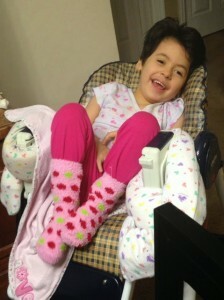 Daniella and her family need ramps and tie-downs for their vehicle. The new equipment will make traveling safer and easier for her. Please be a sponsor for Daniella.